I woke to find three itchy red weals on my face. Another two on my neck. And an ugly, angry sprinkling over my shoulders. Welcome to Camino life where the most pressing issues of the day are an endless computation of sprains, pains, blisters and bites. Just like “ordinary” life there are good and bad days on the road, and this one wasn’t starting too well. I applied ointment from my pack, stuffed my sleeping bag and clothes in plastic bags in case of contamination, strapped on my rucksack … and walked on. The initial diagnosis was bedbugs. 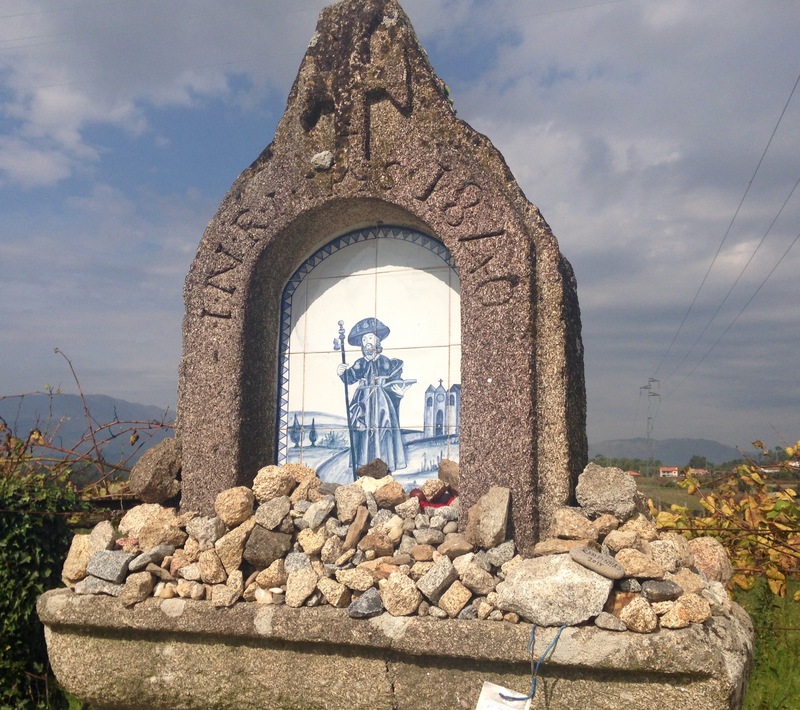 They’re endemic on the Camino and like most pilgrims I suffered three years ago on the Camino Frances. A row of three bites in the morning is usually a clue that they’ve feasted on blood for breakfast, lunch and dinner. But these bites look different. “Mosquitos?” suggested the man behind the counter in the minimercado, the closest the first village had to a farmacia. “Or spiders?” I bought some mosquito bite ointment… and walked on. A chocolate croissant from the hot bread shop on the way to Balugâes distracted me for a while and propelled me past the popular albergue near Lugar do Corgo, although I did look longingly at its welcoming sign. 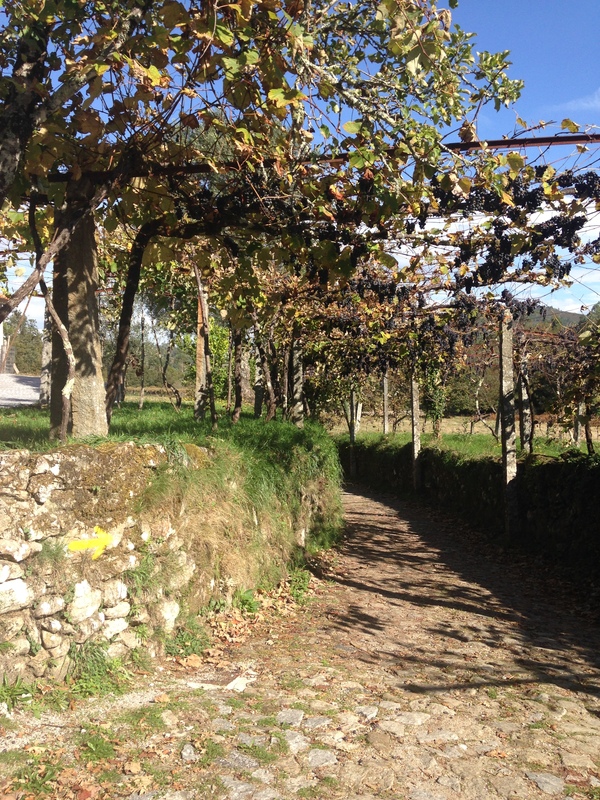 Then it was onwards for hours across hot, flat farmlands and under trailing vines to the beautiful Ponte de Lima. The albergue was all the way through town on the far side of the bridge and the beds up a cruel two flights of stairs. I badly needed a shower to wash away sweat, dirt and bugs but instead I lay on the floor for half an hour and rested my legs up the wall as the dormitory slowly filled with hot, smelly pilgrims. I then spend most of a restless night doing yoga to the accompaniment of a cacophony of grunting and snoring. I stretched seized shoulders, attempted to lloosen a tight spine and neck, and applied a growing concoction of potions to my deteriorating complexion. And all through the wee small hours I questioned precisely why I was subjecting my body to such sleeplessness and discomfort. Tomorrow might be one of those good days. Oh, ouch! Moan, groan. But I’m sure the chocolate croissant helped. Thanks Nadine. No point in glossing over the grittiness of the adventure. Onwards! And so easily dismissed when we start to plan the next trip! In 2013 while walking the Chemin de Saint Jacques from Le Puy to SJPP, something similar happened to me and the village pharmacist, assistant and customers gathered around me in the shop, I took off my shirt and the consensus was an allergic reaction to mosquito bites = anti-histamine cream. It took a week to fade and stop itching and two weeks to stop looking awful. My theory was a spider bite, but mossies it was. Why? Because the good moments outweigh the bad and the moments of sublimity cure every ill. The jury’s still open but I prefer the mossies theory to the thought of a spider crawling all over my face and neck. And I know you’re right but I’m still waiting for subliminally to appear on this trip! I always travel with antihistamines. Fexofenadine hydrochloride(180mg) helps with allergies and bug bites. Thanks. I’ll look out for it and it’ll be in my pack next time. Sending healing thoughts for those bites and sore muscles! Thank you. I realise I’m moaning a lot but when you’re limited in your ability to fix even small issues they assume huge proportions. It’s taking time to adapt to this trip. I’m glad you’re sharing all the bits-even the unpleasant ones.